Sericare is division of Healthline Private Limited based in Bangalore, India, working in the area of developing and marketing products for Sericulture farming since the year 2000. From 2010 onwards it has diversified into development of value added products from in-put, out-put and co-products of sericulture for various human use and applications in the area of food, cosmetics and therapeutics. While the mulberry farm from where leaves are sourced for SeriCha production is organically certified, all the manufacturing plants producing various innovative products of the company have GMP certificates along with necessary Food and Drugs administration clearances. 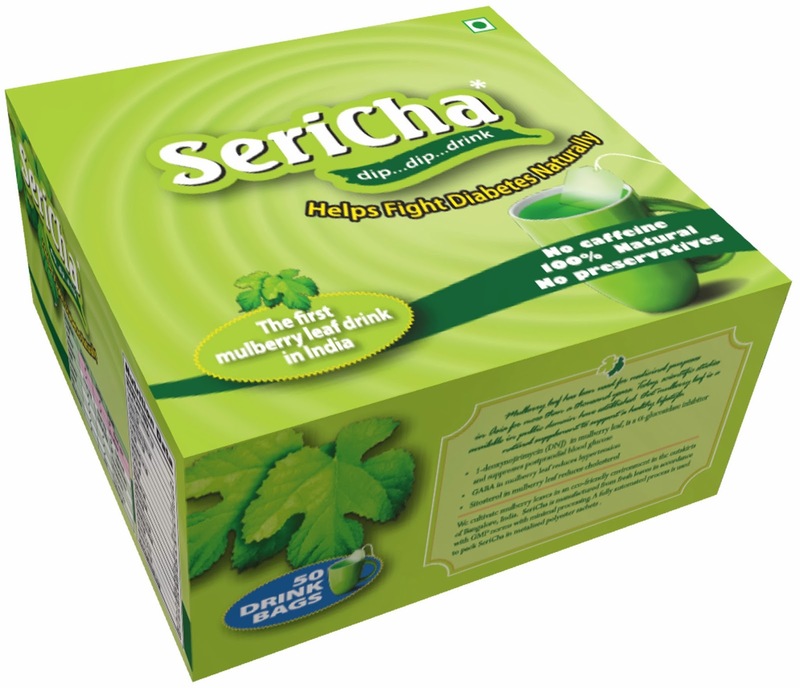 SeriCha, is a product of Sericare Division of Healthline Private Limited. It is specifically processed mulberry leaf grown in an organic farm near Bangalore with no residues of pesticides, heavy metals and other contaminants. The processing of leaf is done in a “Good Manufacturing Practices” certified facility. The product is placed in the market in the form of easy to use dip bags. Mulberry is a tree belonging to the genus Morus of the family Moraceae. It is distributed over a wide area of tropical, subtropical, and temperate zones in Asia, Europe, North America, South America, and Africa. There are at least 24 species of mulberry with more than 100 known cultivars. Historically the trees have been planted for sericulture in east, central and southern Asia. According to Shennong’s Materia Medica, a Chinese medicinal plant book, mulberry plant’s origin is believed to be the first century BC. In that book, mulberry leaves were described as useful for relieving cough, high blood pressure and palsy. When dried in the Sun and brewed the resulting tea was known by the name “immortal mountain wizard tea”. Mulberry has been used in Chinese medicine since 659 AD. The virtues of mulberry have been extolled in “Book of Songs” written in 1000 BC. On the basis of folklore remedies, the leaves have been used as a Chinese herbal tea, especially for diabetes. In the “Compendium of Materia Medica”, written in the late 1500s, Li Si Zhin recommends leaves of white mulberry for treatment of diabetes and obesity. Silk making reached Japan by the fourth century AD, so Japan has a long history with the mulberry plant as well. In fact, kuwacha (mulberry leaf tea) consumption is older than tea for the Japanese, considering that tea seeds first came to Japan during the Heian period (794-1185 AD). It has been traditionally drunk in Japan for many years because of its health benefits. In the modern era, health benefits from mulberry products have been verified scientifically, with mulberry leaves shown to have potent α-glucosidase inhibitory activity mainly because of presence of azasugars. Azasugar,1-Deoxynojirimycin( DNJ) is a naturally occurring alkaloid from the mulberry tree, which was first isolated by Yagi et al. in 1976. Chemically DNJ is a glucose analogue with an NH group substituting the oxygen atom of the pyranose ring. In recent years, DNJ has attracted considerable interest because of its effective and specific inhibition of various carbohydrate-degrading enzymes involved in a wide range of important biological processes, such as intestinal digestion, hepatic glycogen breakdown, lysosomal catabolism of glycoconjugates, and maturation of the sugar chains in glycoproteins. Modification of carbohydrate metabolism by dietary foods and drugs may have therapeutic value. Recently, several animal and human studies have supported the administration of mulberry leaf or extract to suppress the postprandial increase of blood glucose levels. After oral administration, DNJ is absorbed into plasma in intact form from the alimentary tract and reaches a maximum plasma concentration at 30 min before quickly diminishing from urinary excretion. α-glucosidase, located in the brush-border surface membranes of intestinal cells, is considered to be the most important enzyme in digestion of starch and other carbohydrates. DNJ binds to the active center of α-glucosidase and is a potent inhibitor of this enzyme in the small intestine resulting in a decrease of glucose absorption and therefore decrease in blood sugar levels. Because of its moderate activity in vivo mulberry leaf tea or extract is considered as a functional food instead of a drug. There are several international studies on mulberry leaves and extract. A study conducted by Kimura on humans with mulberry leaves showed a suppressive effect on the postprandial increase in blood glucose It was shown that DNJ prevented diet-induced obesity through an increase in adiponectin in mice. Oral and intravenous glucose tolerance tests and labeled 13C6-glucose uptake assays suggested that DNJ inhibited intestinal glucose absorption. Studies also showed that DNJ down-regulated intestinal SGLT1, Na+/K+-ATP and GLUT2 mRA and protein expression.Nagendra and Shiva conducted a study on 75 diabetic patients at Mahalakshmi Clinic, Mysore using mulberry tea, and recorded significant reduction specifically in postprandial blood sugar levels in both men and women in various age groups. The mulberry tea was made by using 2.5g of dry mulberry leaf suspended in 75ml boiling water for two minutes. The tea was given twice daily just before morning breakfast and dinner. The result shows that mulberry leaf extract has direct effect on reducing diabetes. Recently Banu and coworkers from Sri Jayadeva Institute of Cardiovascular Science and Research, Bangalore studied effect of mulberry tea on dietary reduction of postprandial hyperglycemia seen in metabolic syndrome and type-2 diabetes. The study was designed with follow-up diabetic patients, 20 of them as controls who were given plain tea and 28 of them were given mulberry tea containing DNJ to measure effect based on FBS and PPBS. Fasting blood glucose sample was collected, followed by standard breakfast and one cup of 70ml tea with 1 teaspoon of sugar. The postprandial blood glucose was measured again at 90minutes in all 48 patients. with very large effect size. SeriCha, a product of Sericare Division of Healthline Private Limited*, is specifically processed mulberry leaf grown in an organic farm near Bangalore with no residues of pesticides, heavy metals and other contaminants. The processing of leaf is done in a “Good Manufacturing Practices” certified facility. The product is placed in the market in the form of easy to use dip bags. A clinical investigation was undertaken by Neeta Deshpande of Belgaum diabetic centre of Belgaum which is a randomized, single blind, placebo controlled, parallel group study of comparing SeriCha (SC) with commercially available green tea (GT). The study population consisted of type 2 diabetic patients (n-30) with duration of less than five years. The tea prepared as per the manufacturer’s recommendation was offered to subjects three times a day and study was continued for 8 weeks. At entry into the study, a detailed medical history was obtained as also complete physical examination, vitals, and anthropometric measurements. Baseline HbA1c, lipids and blood sugars were obtained. Subjects were followed up every fortnight for 2 months and evaluated for any adverse events, blood sugar levels, vitals, etc. Compliance to treatment was checked and ensured at every follow-up visit. At the last visit, anthropometry, vitals and lab parameters such as HbA1c, lipids and blood sugars were evaluated again. Other safety parameters such as liver enzymes and creatinine were monitored. 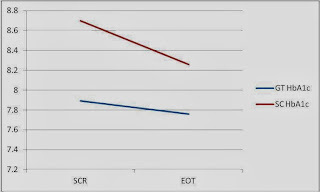 All the results presented are a comparison of effects from baseline to end of treatment (EOT) within each group. 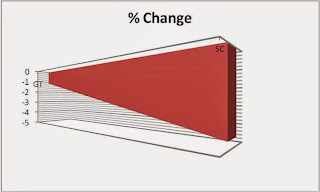 Percentage of subjects with FBS reduction: 92% in SC group had a mean FBS reduction of 56.4 %, ie, 29.4 mg%, from baseline to EOT (p 0.003) whereas 70 % subjects in GT group had 58.8 % reduction (28.1 mg %) (p 0.009). Percentage of subjects with PPBS reduction: 84.6 % in SC group had a mean FBS reduction of 132.5 %, ie, 64.7 mg%, from baseline to EOT (p 0.0005) whereas 70 % subjects in GT group had 115 % reduction (49.8 mg %) (p 0.0001). 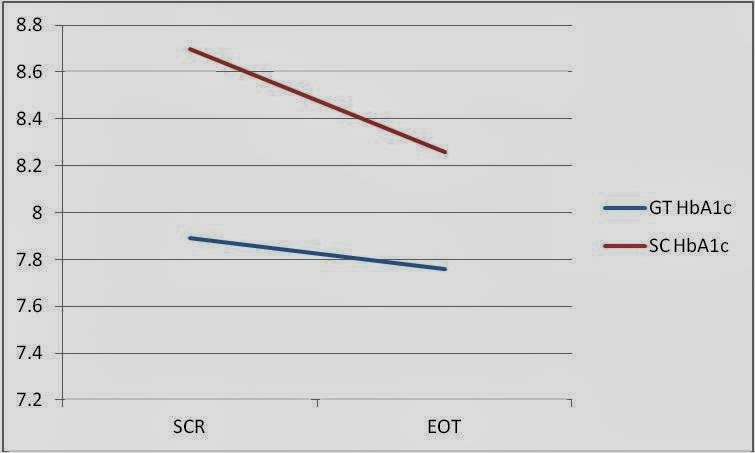 HbA1c reduction: In the SC group the reduction from baseline to EOT was 0.5 % (p 0.028) whereas it was 0.1 % in the GT group (p 0.22). HDL: No statistically significant change in either group from baseline to EOT. LDL: Modestly significant decrease in GT group and no change in SC group. Total cholesterol: Reduction in both groups, but slightly more significant in GT group. Triglycerides: No change in either group. 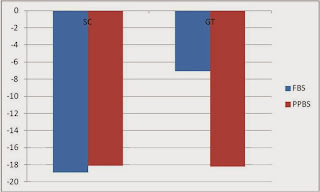 SGOT: Significant reduction (p 0.02) in SC group compared to GT group (0.62). SGPT: Reduction in both groups, but not significant. Serum creatinine: No change in either group. Systolic BP: Very modest reduction in SC group, but not significant. Diastolic BP: Reduction in both groups, but not significant. Anthropometry: No change in either group with respect to weight/BMI or body fat percent. No significant adverse events were observed in both group and none that could be related to either SC or GT. All patients completed the study with good compliance. Overall it can be concluded that tea/extract made out of mulberry leaf has significant effect both on fasting blood sugar and postprandial blood sugar in case of type II diabetic patients and SeriCha, which is processed through good manufacturing practices and obtained from mulberry plants cultivated organically along with effectiveness assures safety to the consumers.